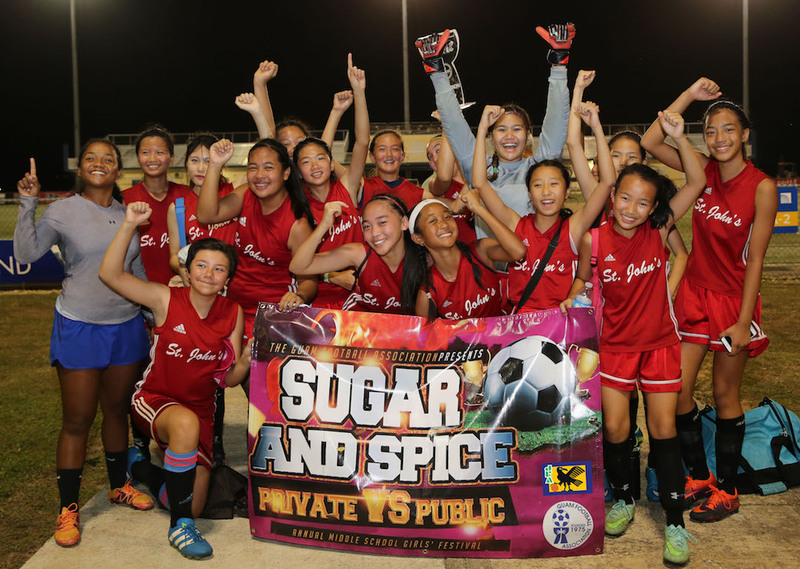 PRESS RELEASE – The St. John’s School Knights topped two-time defending champions Bishop Baumgartner Memorial Catholic School Obispos 1-0 to win the 2017 Guam Football Association Sugar and Spice Middle School Girls Soccer Festival Saturday at GFA. In the final showdown, interrupted momentarily by an early-evening power outage, the Knights managed to shift momentum in their favor in the closing minutes. With just two minutes left on the match clock, the Knights’ Kaia Malakooti took advantage of a mistimed ball clearance by Obispos defenders and lofted her shot into the upper near post for the eventual game winner. The 10th annual festival, realized with assistance from FIFA and support from Japan Football Association, featured 11 teams from both the IIAAG Middle School Girls Soccer League and the Interscholastic Middle School Girls Soccer League. For the teams, the festival is the lone opportunity for the teams from the two different leagues to compete against each other. Following the championship match, GFA Executive Committee Member Gian Tenorio presented the Knights with the champions trophy. Also recognized in the ceremony were the runner-up Obispos team, third place Luis P. Untalan Middle School Wildcats, and silver bracket winner F.B. Leon Guerrero Middle School Hawks. A Rylee Guzman goal helped the Wildcats to a 1-0 third-place finish over the St. Anthony Catholic School Raiders. The Hawks won 2-1 in a sudden death penalty kick shootout against the Harvest Christian Academy Eagles in the silver bracket final. The festival kicked off a series of women’s and girls’ football events in celebration of AFC Women’s Football Day, recognized across the continent on Mar. 8. Other events at GFA this month include the Take Care Achieve Your Goals Women’s Recreational Festival held Sunday afternoon, the upcoming launch of the first-ever Bud Light Women’s Soccer League W2 division Mar. 12, and the 6th Annual Girls High School Soccer Pre-Season Challenge Cup set for Mar. 18.